Whenever someone reads the word “Superfund” in the news media, negative words that come to mind might be, “controversy, delay, outrage, cancer, mistrust,” and the list goes on. Superfund and the political and public battles that go along with it are prime meat for the press, especially when you tie in environmental and health risks and “big government.” Coming from a journalist, I can easily see how these types of stories spread like wildfire. But, John Hird’s suggestions for reform of what he calls an inherently inefficient law that was doomed from the onset, may easily make hazardous waste sites less dramatic and therefore less newsworthy. Although the book did not focus entirely on the problem with the public’s perception of risk, he did mention it quite a bit and I found what he had to say very insightful. Instead of the usual risk communication books that only cover superficial explanations of why experts are always pitted as “against” the public, Hird put the entire problem in the context of the law itself. Most generic risk communication books suggest problems such as “mistrust of institutions” are to blame for public outrage, and that greater transparency and honesty are the typical cookie-cutter solutions. Nothing is ever that simple. Since my thesis is focusing on evaluating the risk communication efforts of the EPA and the Department of Health to residents who live near the Koppers Superfund site in Gainesville, this book really put into context the history of the law and why it was flawed from the beginning. By understanding this, I can better understand why communication efforts are so tricky, and may not be the right solution to the bigger problem. Hird begins by explaining how the public perceives chemical hazards. This is important because ultimately public perception of these problems, along with the pull of legislators, is what prompted the solution of the cleanup of abandoned hazardous waste sites such as the infamous Love Canal in New York. Ironically, public perception and fear is also part of the problem with Superfund’s inefficiency. Hird suggests there are more pressing and concrete environmental and health concerns that we should be fearful of and that Superfund sites are not at the top of the list. Hird notes that Americans rate hazardous waste sites as the number one environmental problem (although this book and the study he cited are outdated by now), even when compared to global warming, deforestation and other problems with more “sound” science to back up the claims. The reasons for this fear of chemicals stemmed from many factors. First, Rachel Carson’s Silent Spring garnered national attention to the risks of pesticides. After that, national news agencies began devoting much more space to environmental stories focusing on health risks such as air pollution, water pollution and solid waste. This was a stark shift from earlier environmental concerns, which focused on themes of conservation, wilderness and stewardship. Hazardous waste sites are a particular concern to the public since they are typically involuntary. Citizens didn’t choose to have a health risk—no matter how minute—near their home or children. The involuntariness is what makes the public angry, even though at most sites, the risk is no greater than chemicals and pollutants one might be exposed to naturally in their everyday lives. While most of the science today regarding waste sites poses the risks as being minimal comparatively, Hird notes that the amount of uncertainty along with research agendas means the risks could be bigger than we think, or they could be minimal. Most research suggests the risks are overstated. In addition to the public’s fear of hazardous waste sites, mistrust of the Environmental Protection Agency is another reason that American’s disagree on the risk of hazardous waste site. But the public’s mistrust alone is not enough to cause the spout of blame, conflict and inefficiency that Hird explains has plagued Superfund. Hird also explained that like a small puppy who knows it is in trouble, the EPA sometimes will sulk and hide even more from the public, and will never brag about the accomplishments it has made to Congress, furthering political polarization. Despite the controversy, the book proposes that Superfund indeed has good intentions, but those intentions are not carried out in the right way. Hird organizes the book into three sections: assessing and managing risks, efficiency, equity and distributive politics, and explaining and reforming Superfund. In each, he proposes some of the problems with each and in the last section he gives some suggestions for reform and the current limitations on implementing them. I will summarize each section, highlighting some of the themes that resonated with me throughout the book and offer my critique on the solutions. Assessing and managing risks, as Hird points out, are two very complicated tasks. The quote from the book that most describes this point is, “Even when risks are acknowledged to exist, the range of scientific estimates is enormous, (pg. 33). Using animal bioassays and human epidemiology both have tremendous limitations and can both yield very different ranges of results. When there is a problem in assessing the risk, managing the risks is even more difficult. How does one communicate this uncertainty to the public? Sure, there may be a .000001 chance someone may develop cancer, but how can you justify to the public that one of their peers might die? In general, the public doesn’t speak in pure numbers like scientists, so this is a hard point to get across. Secondly, it is almost impossible to rule out that someone’s cancer indeed was caused by chemicals from a site when there are so many other possible carcinogens coming from every direction in a human’s life. Finally, the risks can be biased based on a scientist’s agenda. For example, the responsible polluter may hire a scientist that rates the risks as minimal, whereas a lawyer representing outraged residents my contract a scientist who works the statistics to overstate the risks. Two different viewpoints in risk management Hird notes are the populist and the rationalist viewpoints. The populist viewpoint asserts that the ultimate risk is the perception of the risk and the public should have a role in managing it. The rationalist view, on the other hand says that it is best to stick to science in order to come up with a cost-effective solution. While I am inclined to trust the science, I also believe the populist viewpoint cannot be ignored for obvious reasons. In the next section, Hird delves into the politics and economics of the law, dissecting its inefficiencies piece by piece as well as defending or refuting arguments made on Capitol Hill. He explains that Superfund was a rushed law and not well thought out at the beginning. The fund was not sufficient and the vast number of sites on the list was ineffective. 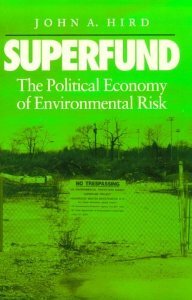 In addition, he explores the notion that Superfund also has the possibility of being a pork-barrel program in which constituents may fight for site in their state to be placed on the National Priority List, in order to gain votes, making them look like they have political pull in Washington. He concludes that while this is a possibility it is difficult to distinguish between a legislator’s ideologies and political agendas. Hird then discussed the notion of equity and found that contrary to prior belief, sites are not typically concentrated in lower income or minority areas. Quite the opposite, they tend to be in wealthier areas, which could be due to the fact that those communities are more organized to get their sites designated on the NPL. However, he also stated that social minorities could be disparaged. For example, a poorer community may not be organized enough to get a site designated, or would rather make the tradeoff of health for more jobs and income. So, in that way Superfund could be lopsided. Finally, Hird spoke about the pros and cons of having Superfund either federally or state-funded. While the arguments for the program being federal now (chemicals can go across state lines, sites are everywhere, citizens across the country contributed to the problem, etc.) are good, Hird also poses suggestions as to why implementations would be better handled at a state or local level. That is where one of his major reforms comes into play. Hird’s overarching suggestion for reform of Superfund is that funding would still be federal, but that cleanup decisions would be made at the state or local level. Of course, he goes into much more detail, but that is the main concept. His argument is that states cannot be held with the responsibility (and frankly, don’t want it) to allocate the money to these sites. But, states know their people and can best be held with the decision of how to clean up the site. In my opinion, I think that would work. During my preliminary interviews I am conducting for my thesis, I have found a common frustration among residents to be the lack of power of local officials to influence cleanup. Giving them a bit more power in that arena would may allow for more resident input and therefore more satisfactory outcomes. Secondly, Hird suggests that there be a separate fund for sites that were designated prior to 1981 and those after. This is because the responsible parties for sites designated after 1981 would have been aware of liability beforehand. The sites prior to 1981 would have a hypothetical NERF (National Environmental Restoration Fund) to finance these sites in order to eliminate unfair costs to parties who dumped legally before the provision. In conclusion, I believe the more detailed version of Hird’s suggestions for reform may work, but the problem is and always will be funding. Eliminating the way sites are currently placed on the NPL (using a very problematic hazard ranking system (HRS) method) does not ensure that the most risks are eliminated for the best price. Actually, it doesn’t even ensure that the most hazardous sites are the ones on the list and separating them and using more site-specific standards would help this discrepancy. I believe Hird’s suggestion to look at the problem as, “How much risks can we eliminate using this finite amount of money?” is a good way to look at it than what is currently being done. Instead of focusing on the sites with the most costly cleanups, but not necessarily the biggest risks (since the criteria for the NPL is arbitrary) is not as efficient as perhaps cleaning up multiple sites with cheap cleanups, but still reducing overall risk. The only critique I have is that Hird seemed hopeless on the communication front, as if it really makes no difference. I guess I am biased since I am a communications major, but I think even though the law was flawed from the beginning, and the public has seen these flaws more and more, communication can help at multiple levels. I would have liked to see more suggestions in this arena. In conclusion, this book really put into context the entire notion of Superfund in a way that let me relate everything back locally to Koppers. There was so much context, I had a hard time deciding what to include here, but I would recommend this book to anyone working in any arena of Superfund to get a full history and analysis of the controversial law first-hand.